Today we represent, Canadians and Americans firms as their TRADING PARTNER in Mexico, with our service they are able to export and sell in Mexico through our company without any legal risk or investment. Lopezadri Distribution is our Mexican “active” importer company with all legal requirements to IMPORT commercial & industrial shipments. We offer Third party importer services, which is the perfect solution for overseas suppliers to trade and Export to ”non importers” Mexican customers, which represent an unreachable & valuable market for international exporters. In addition our customers gain advantage over their competitors by increasing their sales scope and by upgrading their negotiation strategies. Our third party importer services, is a great valuable asset for your International sales staff. 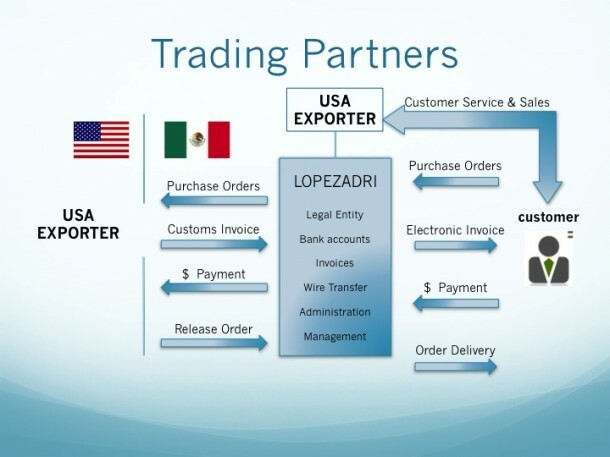 This service allows our partners to have a real business presence and to deal or sell, under ”DDP” conditions (door to door) to the Mexican market as a local sale. In order to accomplish our Trading services, our Group offers support on logistics door to door freight coordination, custom brokerage, forwarding, distribution from our warehouses, and material handling at the border.